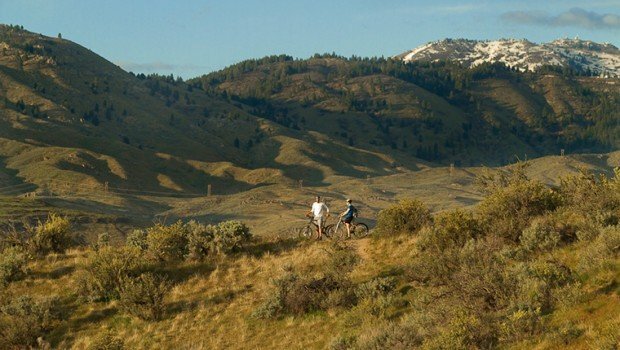 A new easement connects popular Ridge to Rivers trails in the Boise Foothills. The easement is actually 3 proposed pieces, and when looking at it on a map, is shaped something like a wiggly “X”—the upper left point connecting to Hidden Springs, the upper right to Stack Rock Reserve, the bottom left linking to Polecat Gulch, and the bottom right to Bogus Basin Road. The finished trail will also traverse smaller portions of land owned by the Hidden Springs Association, Bureau of Land Management, and the US Forest Service. The Daniel’s Creek area contains a variety of landscape, “some of it riparian near Daniel’s Creek, a lot of it open foothill terrain, though unique because of unusual rock outcroppings,” says Grant. “The area is unique, different from say Hulls Gulch, or the Military Reserve.” It’s also rich in plants and wildlife species, and development of the trail will take into consideration protection of those that thrive there. Grant explains that city officials and Idaho Fish and Game need to walk the trail to appraise its exact length and to consider how the trail impacts wildlife. “To get the trail in shape for public use will take 12 to 18 months,” she says. People are surprised by the time needed to get the trail ready, but Grant explains that currently there are a lot of trails up there, a mix of grazing, wildlife, and rogue trails, some eroding away. The new trail will be graded, sustainable, with low maintenance needs, and sign-posted. The city is also considering creating a new trailhead off of Bogus Basin Road to create a safe access to the trail system. Conversations between the city and the Grossman family about an easement through Daniel’s Creek have been ongoing for over a decade. “Nothing specific brought about the donation,” says Tom Bobo, Development Manager at Grossman Company Properties, “just efficient, effective work by the city, Boise Parks and Recreation, and the mayor.” In the end, Bobo explained, the family decided it was good for the community to enhance Boise’s beautiful resource, the Ridge to Rivers trail system, in the city’s backyard. For Bobo’s part, he’s looking forward to riding an improved and legal “Sweet Connie,” a popular trail between Pole Cat Gulch and Bogus Basin. Overall, the Daniel’s Creek easement enriches an already excellent trail system by adding these integral new connections.